A striking tapestry depicting the archangel St Michele. 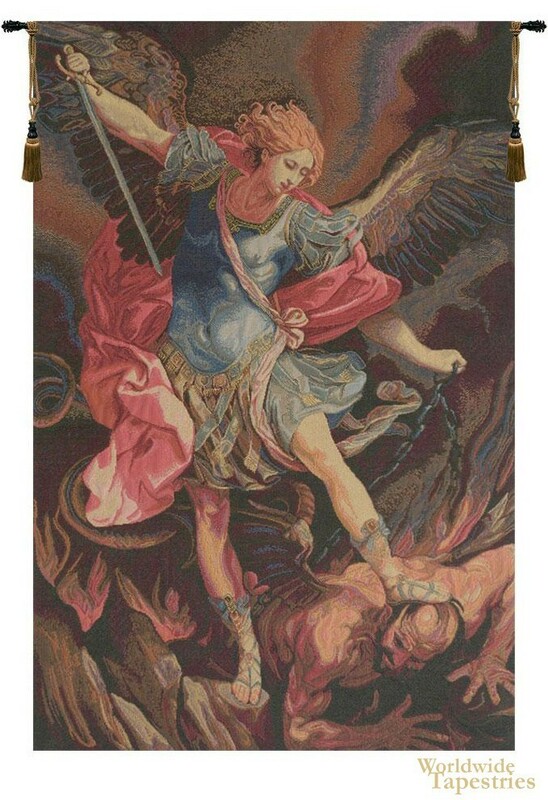 Based by the original by Guido Reni (1635), who created this rendition of the Archangel Michael for Capuchins' Church in Rome, this tapestry shows his hallmark of drama and beauty. Guido Reni (1575 - 1642) was a painter in the high-Baroque style and his works included many religious works from commissions during his work in Rome, Naples and Bologna. In this scene, in the church also known as Santa Maria della Concezione dei Cappuccini, or Our Lady of the Conception of the Capuchins, we see St Michael trampling on the forces from the underworld, in the first chapel used as the altarpiece. A truly dramatic work which shows a masterful use of light and color to create a striking work by this Italian master. This tapestry is backed with lining and has a tunnel for easy hanging. Dimensions: W 12" x H 18"